This is the story of the unusual friendship between two of the most intriguing individuals of the early twentieth century — the renowned illusionist and escape artist Harry Houdini and the celebrated mystery writer and creator of Sherlock Holmes, Sir Arthur Conan Doyle. Both men were fascinated by the occult practice of Spiritualism, Houdini as an ardent skeptic and Conan Doyle as a true believer who was convinced that the dead could and did communicate with the living. While there are many biographies of both men, this is the first book to detail the years of their friendship and their battles over the veracity of Spiritualism. 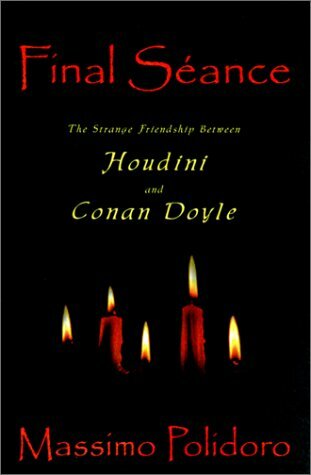 During their five-year friendship, Houdini and Conan Doyle exchanged views about Spiritualism; conducted investigations of notable mediums of their day, such as Mina “Margery” Crandon; and even enjoyed vacationing together at Atlantic City. Fans of Conan Doyle, Houdini, magic, and the historical roots of the “New Age” will be delighted by this amazing story. “An exhaustive, mostly entertaining history of this improbable friendship. Polidoro's book is shrewd and engaging." “(A) fascinating clash of mammoths and a delightful excursion into a just-past era… (Massimo Polidoro) is a disciplined scholar, and maintains a keen balance… Polidoro has written well – a saga of two Titans that is also a remarkable exploration of both superstition and obsession”.